In some cases, a single pipeline is used to transport a diverse array of chemical products. When discrete chemicals are moved sequentially through the same pipeline, a mechanical separator known as a “sealing pig” or “batching pig” is inserted between the sequential products to prevent inter-contamination. Since the pigs are never completely effective at blocking the interface, a significant volume does suffer intermixing and must be removed for reprocessing. The amount of material routed to reprocessing is usually just pre-programmed with a large margin of error on either end of the interface to ensure removal of intermixed products. This is a simplistic model that is unnecessarily wasteful of material and time. By using a device such as the Applied Analytics™ OMA industrial analyzer, the chemical concentrations, purity, and physical properties can be measured in a continuously drawn sample from the liquid stream. 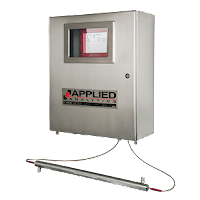 This allows for real-time analytics of the materials in the pipe, including chemical concentrations, purity, and color. The OMA system continuously monitors full-spectrum absorbance in the pipeline stream. A change in this spectrum indicates a change in the purity/composition of the material passing through the pipeline. Therefore, the OMA immediately detects the ‘interface’ point where the material has begun to intermix with the subsequent material in the pipeline. Monitoring the 1st derivative of a complete UV-Vis/SW-NIR absorbance spectrum allows the OMA to detect changes in composition with high sensitivity and fast response. The user can define the threshold contamination level which will signal for rerouting of the stream. For more information, contact Ives Equipment at http://www.ivesequipment.com or call (877) 768-1600.